5 days (September 26 - 30), 5 headline acts, 50 emerging acts, 5 daytime workshops and 500 guests per day only. Confirmed acts include Morcheeba, Trevor Nelson, Delilah, Noisettes, Omar, Ghostpoet, and many more. Experience a music festival in a uniquely intimate setting right in the heart of the City at Apartment 58 - London's most central and newest creative hub under the iconic Centre Point - featuring some of the UK's best established and emerging musical talent. Acts include Morcheeba, Delilah, Trevor Nelson, Noisettes, Ghostpoet, Omar, Zalon and many others. Apartment 58 is a friend’s of friends invite only Members Club for creatives to work and play, with a particular focus on Fashion, Music, Design, Art and Technology. With Festivals all over the country throughout the Summer, Apartment 58 will host a Boutique City Festival for those that prefer something a little more intimate, and closer to home. The festival highlights Apartment 58 as a creative hub and will serve to promote emerging artists across music. Each day will be curated by an organisation that regularly hosts live music events, including iLuvLive, London Live, Playtime and Music Box. The 5 days of the event will be filmed and streamed live on Google + reaching a much wider audience than the 500 guests. There are tickets available to purchase for the festival and also gain access to Apartment 58. 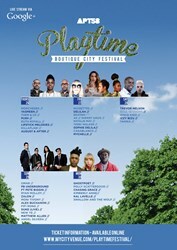 Tickets are on sale now on mycityvenue.com/playtimefestival. Who says you need to set up camp in a field to experience a music festival at its best? You don't even have to leave Zone 1. Head to Apartment 58's Playtime Boutique City Festival and enjoy great acts in the heart of London. The festival runs from Thursday 26 September to Monday 30 September with acts including Morcheeba, Noisettes, Trevor Nelson playing his Soul Sessions set, Omar, Delilah and Ghostpoet. The intimate venue is a great place to experience live music and if you opt for the VIP ticket, you'll get the chance to meet the acts and enjoy food and drink in the VIP area. Fields in late September? No thanks, we'll take a covered building thanks.